The differential pressure gauges of the DELTA-line product family are primarily used for the monitoring of low differential pressures where there are high requirements in terms of one-sided overpressure and static pressure. Typical markets for these products are the shipbuilding industry, process heating technology, the heating, ventilation and air-conditioning industries, the waster/wastewater industry, and machine building and plant construction. For these, the main function of the measuring instruments is the monitoring of filters, compressors and pumps. Often in these applications, alongside the display of the differential pressure, the current working pressure is also relevant. For this reason, a working pressure indication is integrated within the DELTA-plus differential pressure gauge as standard. 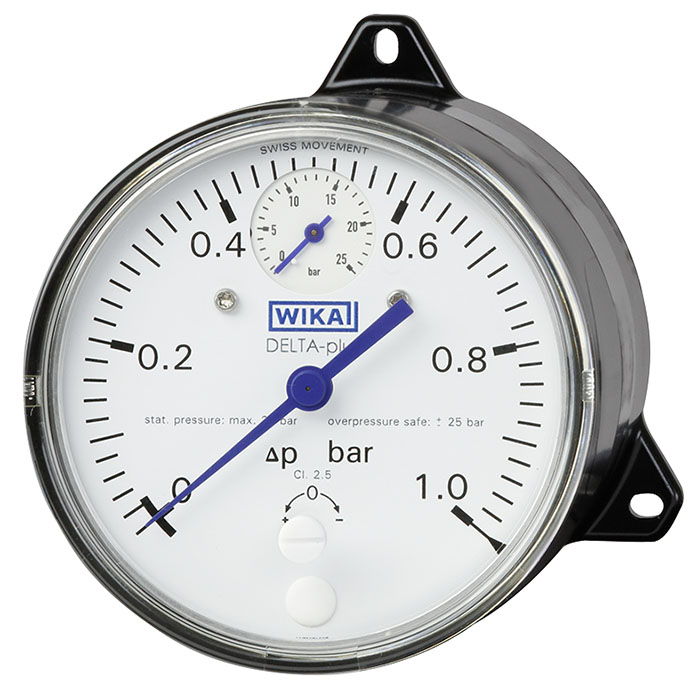 The two local, easily readable, mechanical displays enable the simultaneous reading of the working and the differential pressure. Furthermore, this saves on an additional measuring and sealing point, reducing additional expense for piping and mounting. The robust aluminium case and shatterproof window enable a long service life of the product, even under harsh ambient conditions. As a result of the low pressure range of 0 … 160 mbar, the instrument can also be used for applications with low differential pressures. A further key feature is the high accuracy of up to 1.6 % which is important for most applications.